Each quarter of the year Obtiva consultants gather for a personal development day that reinforces the values and culture of the company. In the first quarter the event is called ObtivaCamp and is focused on Practicing software development. Today was Obtiva’s inaugural ObtivaCamp. It was in the format of a Code Retreat facilitated by Corey Haines. Above are some sketchnotes I took during the day. Overall the event was a success. Take a look at Corey’s Code Retreat page. If it looks good to you my advice is to go for it and call Corey to facilitate. He does a terrific job. My sketch tools include an iPad, the Brushes App, and a Boxwave stylus. I particularly like Brushes App (vs. SketchBook Pro for example) because to draw small text on the iPad you have to zoom in and write really big letters and then zoom out to see how it all looks. Brushes App makes that zooming really easy with a double tap. Also I like that I can export Brushes actions to the viewer on my Mac and then upscale it. Even cooler is the ability to export to a Quicktime video from the viewer. 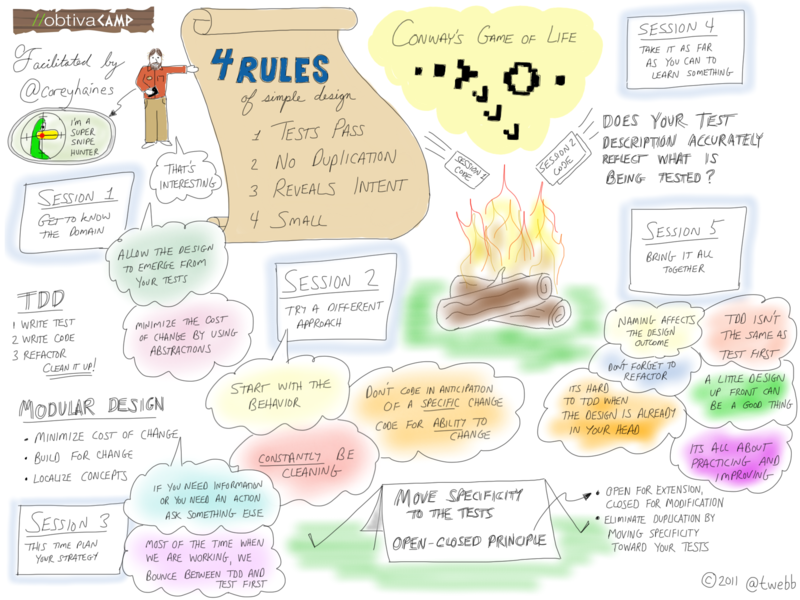 This entry was posted in Articles, Obtiva and tagged sketchnotes by Todd. Bookmark the permalink.